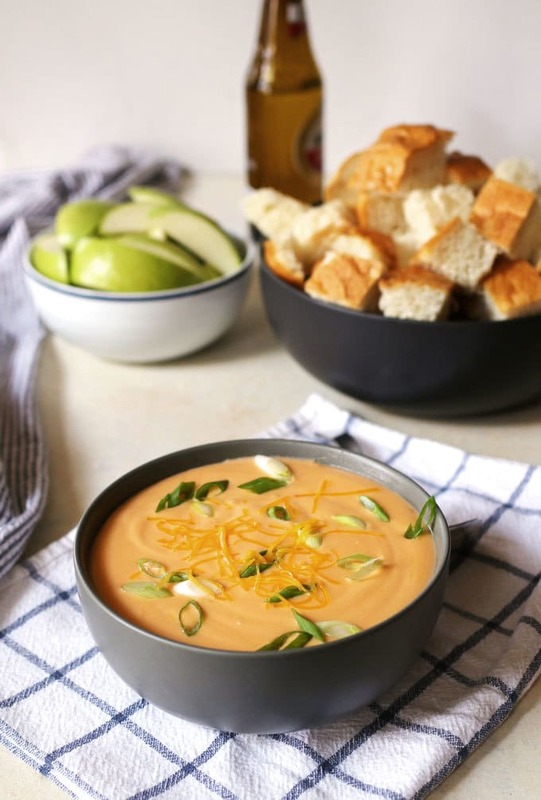 This beer cheese dip is perfect for football parties! Serve it in your slow cooker or fondue pot to keep it bubbling hot. 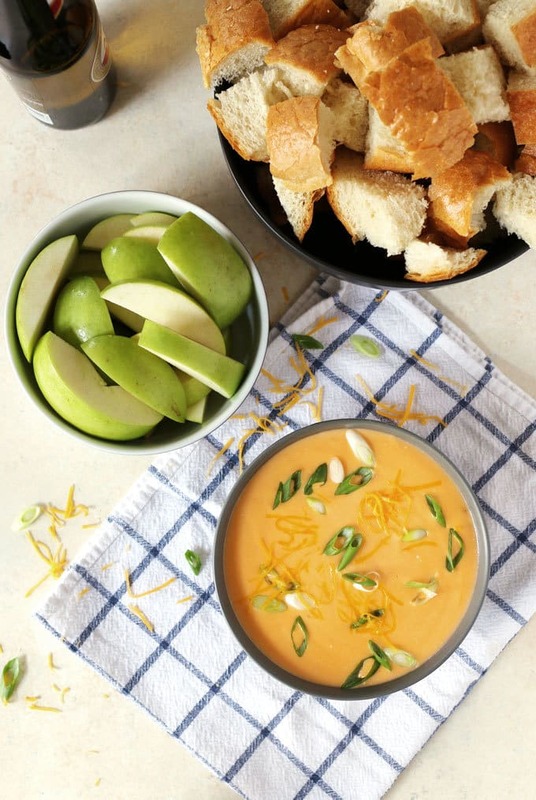 Some bread chunks, apple slices, chips and carrots are the perfect dippers for this dip. I got a craving the other day for beer cheese dip. I don’t know where it came from – just all of a sudden, all I wanted was beer, cheese and things to dip into their glorious union. So I made it. And loved it. More beer cheese dip please. This post contains affiliate links, which sometimes earns me enough money for a cup of coffee. But definitely not enough for a car – A girl can dream! Learn more here. 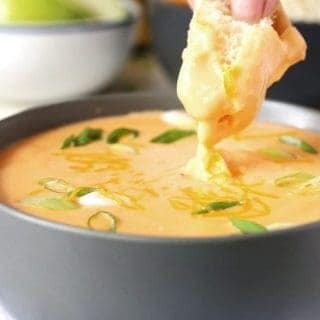 If you’re looking for party food, this hot beer cheese dip recipe is just what you’re looking for. I like to make it in a small pot and then transfer it to a waiting small slow cooker or fondue pot to keep it bubbling hot. You could use many different types of beer but for this version, I either go with a pilsner or a light lager. I want the taste of beer to be there, but I don’t want it to overpower the cheese. What Cheese Should I Use? I use a combination of cream cheese, mild cheddar cheese, and sharp cheddar cheese. Add to that some minced garlic and shallot and you will have a delicious party appetizer! Either way, your guests are going to be asking for this recipe and asking for seconds. 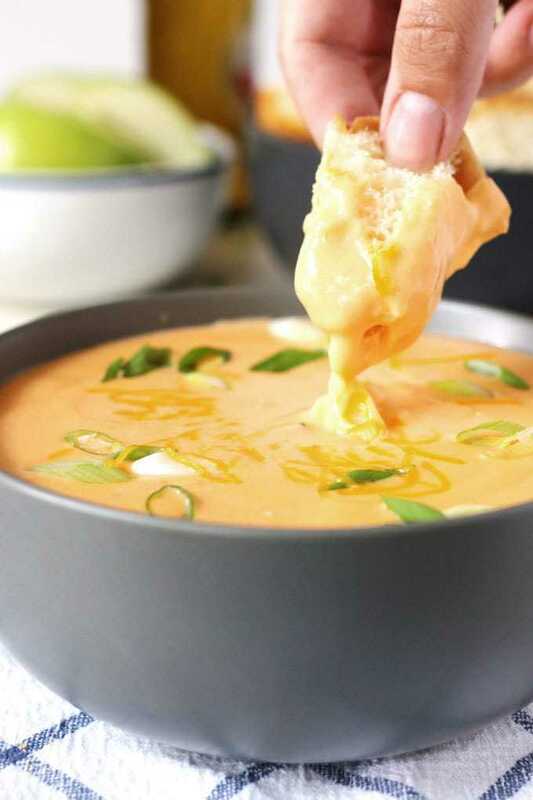 This hot beer cheese dip is perfect for football parties! 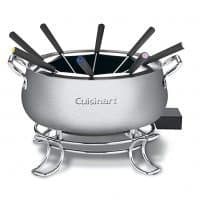 Serve it in your slow cooker or fondue pot to keep it bubbling hot. 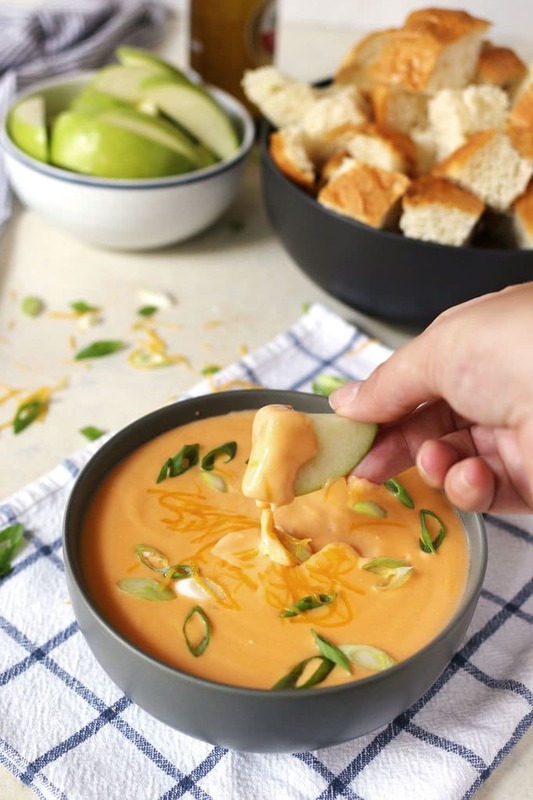 Some bread chunks, apple slices, chips and carrots are the perfect dippers for this dip. In a medium pot, heat the extra virgin olive oil over medium heat. When hot, add the shallot and garlic and cooking for 1 minute, stirring frequently. Add the beer and bring to a boil. Lower the heat to medium low and slowly add the cream cheese. Stir constantly until the cream cheese has melted. Then slowly add the sharp and mild cheddar cheese, stirring until melted. Serve immediately. To keep this dip warm, transfer cooked dip to a small slow cooker or a fondue pot. 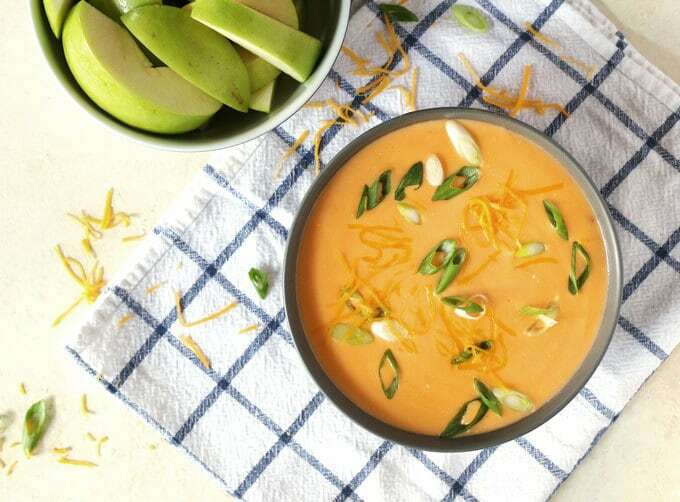 Serve with bread chunks, apple slices, chips or carrots. Looking for more appetizer recipes? 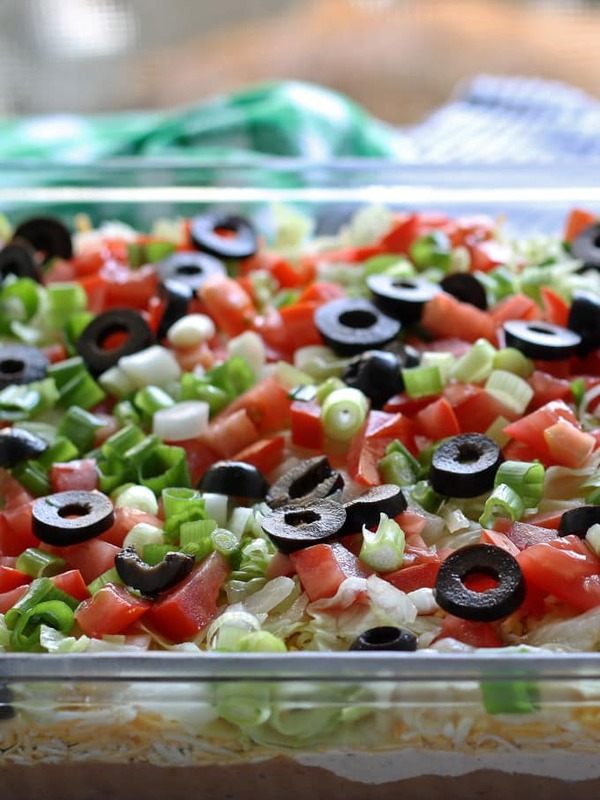 Try my 8 layer taco dip! 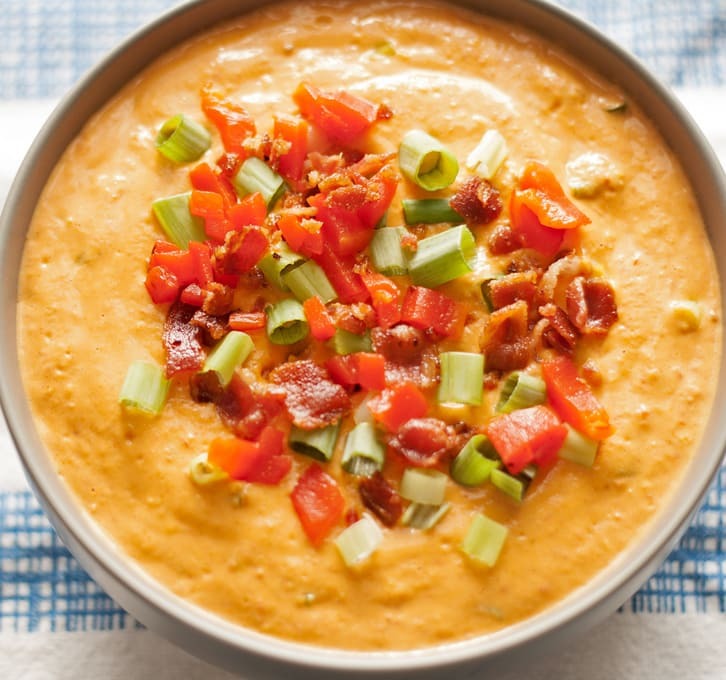 Or this hot pimento cheese dip. 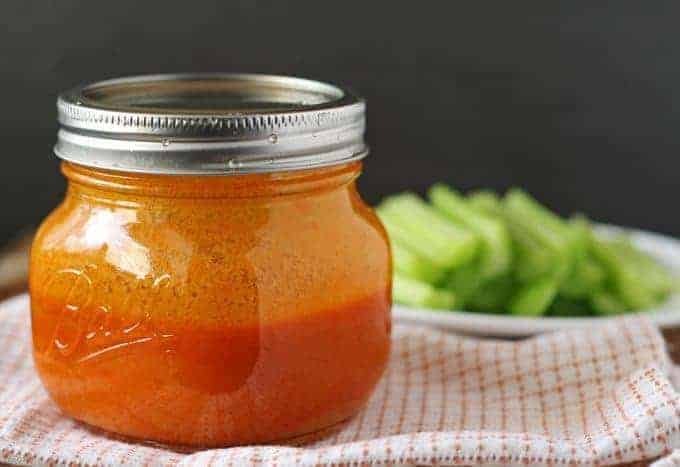 If you are making wings, use my homemade buffalo sauce. This looks totally delicious! Thanks for sharing on the What’s for Dinner link up! Ohhhh dear lord I need some of this in my life.. pronto!! Yum! This is a great appetizer! Hot beer + cheese = winning! Talk about ultimate comfort food. This is a perfect dip for football season! Thanks for sharing the recipe! 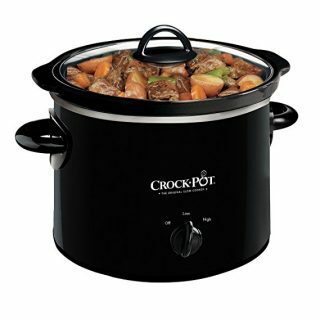 I love the idea of serving it in a crockpot to keep it hot! It sounds SO delicious. I’m a Bears fan too, it’s been a sad few weeks! I think these cheese sauce will help the sadness, haha. 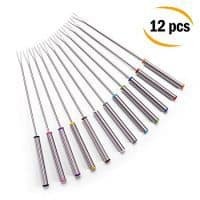 Pinning, I’m going to need this soon! There isn’t much that I love more than a beer cheese dip on a cold day! Can’t wait for it to cool down some! This would go great with my homemade pretzels, Thanks for sharing with us at Throwback Thursday. Pinned and shared! Sounds yummy! BTW would love to win that fountain! This recipe looks delicious — I love anything with cheese! Thanks for sharing your recipe at Craft Frenzy Friday on Mom Home Guide! I just pinned your awesome dip, it will be perfect for the entertaining season! Thanks so much for sharing with us at Full Plate Thursday this week. Hope you are having a great week and come back to see us real soon! Totally new for me. Great creativity, i bookmark it for tomorrow meal. Thanks for sharing your awesome creative dish. It will be great tomorrow. Is the nutritional information correct?????! Holy CRAP if it is!!!!!!! Hi Becky, no the nutritional information is not correct. It is automatically calculated by an app and then I have to manually calculate and fix it. I am working my way through all of the recipes slowly. That is the calorie count for the entire recipe, not serving. Would it still be good if I left out the shallots? My husband hates onions. Do you think this would be ok to make ahead and then re-melt to serve? Hi Samantha, I have served and reheated the leftovers so I don’t see why you couldn’t make this ahead. I just made this for a get together and it was so easy to make! I unfortunately didn’t have shallots so I substituted minced dry onions in its place. I am happy to say that I loved it! I will be using this again for sure! All Images and content are © Honey and Birch. Please do not republish without prior consent.